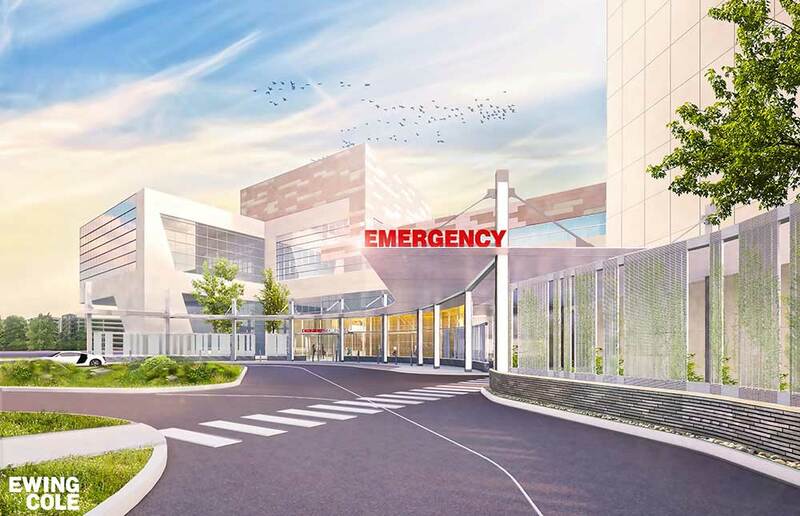 A rendering of the expanded Emergency Department at Hershey Medical Center. The Emergency Department (ED) parking lot and entrances at Penn State Health Milton S. Hershey Medical Center will be permanently restricted to ED patients, families and visitors of ED patients, emergency personnel and ED staff beginning Monday, Nov. 19. All other individuals should use the main hospital or north entrances to access the hospital, rather than the ED entrance. This change is critical to protect safety and clinical operations as the next phase of ED construction begins. The $49 million ED expansion project will add 28,000 square feet of space, renovate 7,000 square feet of space and support a phased realignment of the entire department. The improvements will expedite the start of the care process, improve patient and provider flow and enhance departmental efficiency. The second floor expansion area will include three new operating rooms. The ED expansion project is slated for completion by the end of 2019.